Recently Kris at Attainable Sustainable asked me how to determine how much salt to use in fermented vegetables. I came across a handy chart that said that some foods need less salt than other foods and the determination of how much salt is required depends on the vegetable and the cultural tradition. It seemed very scientific — you need a scale to weigh the salt. It led me to believe that if you somehow got it wrong, you might endanger your family. But it seemed much more complicated than it needed to be. So I did some research and experimenting. What makes vegetables ferment instead of rot? First of all, fermented vegetables ferment instead of rot because of the natural beneficial microbes in them. The job of the cook is to give those beneficial microbes the best possible environment to thrive and multiply. At the same time the environment needs to discourage the bad microbes that cause rot from multiplying and overpowering the mixture. This is where the salt comes in. Salt inhibits the growth of microbes. Food that is naturally high in moisture like finely cut cabbage requires less salt than food with a hard rind, like lemons, in order to discourage the bad microbes. Food that spoils faster, like herrings, require more salt than food that is slower to spoil, like beets. Salt also causes osmosis — a transfer of juices from the vegetables that is replaced by brine, further inhibiting spoilage. When you start to ferment vegetables (or dough or fish) there are hundreds of different microbes on the surface that are vying for supremacy. Whether you end up with rotting food, mold, or a nicely fermented food, depends on encouraging the good microbes, while trying to crowd out the bad microbes. The good microbes thrive in an acidic environment while the bad microbes don’t. Some microbes need air to multiply while the good microbes need an anaerobic environment. You want to begin with more of the good microbes and less of the bad. 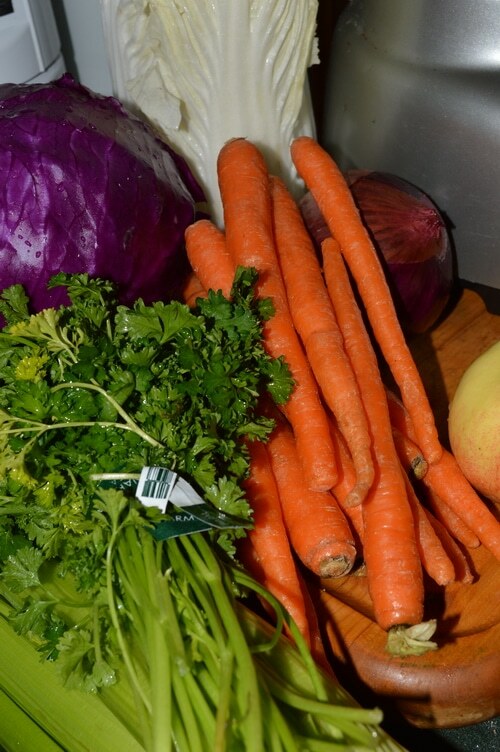 Always wash your vegetables under cold, running water before you prepare them for fermented vegetables. This washes off some of the undesirable microbes right at the beginning. Wash and sanitize knives, cutting boards, jars, and bowls before you begin to make your ferment. Salt inhibits the growth of yeast and delays the bad microbes from reproducing and this is why salt is commonly used in fermented vegetables. Use kosher salt or sea salt rather than table salt (Iodized salt) because the addition of iodine, an antimicrobial, will inhibit the good microbes, too and discolour your vegetables. 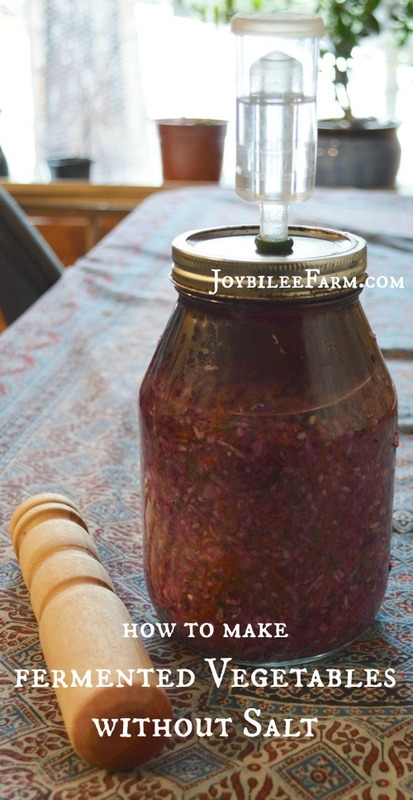 Inoculating a jar of fermenting vegetables with the good microbes will encourage the good microbes to reproduce at a faster rate, crowding out the bad microbes. This replaces some of the need for salt in your recipe. If your recipe calls for 2 tbsp of salt per quart — if you innoculate your vegetables with good microbes you can use 2 tsp of salt instead. Day 1 to 2 Fine bubbles begin to form which break the surface when a knife is inserted inside the jar Coliform bacteria begin the fermentation process. As it grows the mixture becomes more acidic. Day 3 to 5 Large gaseous bubbles form inside the jar. The food is pushed up from the bottom against the weight. Unweighted food is pushed above the brine. The jar liquid overflows through the airlock. The Leuconostoc bacteria are multiplying and continue lowering the pH in the vat. This crowds out the coliform bacteria. Day 5 to 8 The bubbling slows down or stops. The vegetables fall down in the jar and the pressure stops building up. The ferment can be refrigerated. It will continue to develop while in storage. The environment in the jar has become more acidic and the lacto-bacteria is thriving, while the other bacterium and yeasts are being crowded out. The lacto-bacteria are living and active inside the ferment. The fermentation can be slowed by refrigerating the ferment. It can be eaten now or the flavours can continue to develop over months. The jar contents are preserved in the acidic environment of the jar. 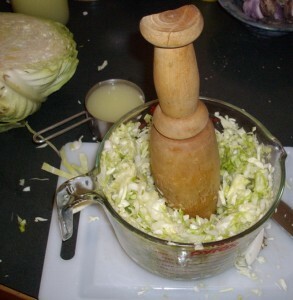 The transformation of cabbage into sauerkraut involves three successive colonisations of helpful bacteria that are dependent on the acidity of the brine solution. While we speak of “Lacto-bacteria,” as the catalyst for preserving vegetables by fermentation, in reality, the Lacto-bacteria require an acidic environment, which develops gradually during the fermentation process. The pH drops within the brine as Coliform bacteria begins the fermentation process. As the environment becomes more favorable the Coliform drops off and the Leuconostoc bacteria begin to proliferate, further increasing the acidity of the brine. Finally the conditions within the crock are acidic enough for Lactobacillus to proliferate, while the other bacteria drop off. None of this is of conscious concern to the home fermenter though. The bacteria increases or decreases as the conditions become favourable. The resulting fermentation preserves the vegetables, increases the bioavailability of vitamin and minerals, and enhances both taste and texture. I was surprised to find out that salt isn’t necessary to fermentation. While it inhibits bad bacteria from proliferating before the good bacteria can crowd it out, inoculating the vat with the good bacteria will inhibit the bad without the addition of salt. The good lacto-bacteria will multiply rapidly, reducing the pH of the vat and crowding out the bad bacteria. (It’s miraculous that bad bacteria cannot survive in an acidic environment – who designed that?) Salt is also used for flavour though, so if you aren’t on a doctor’s mandated low-salt diet you may want to add a bit to taste. 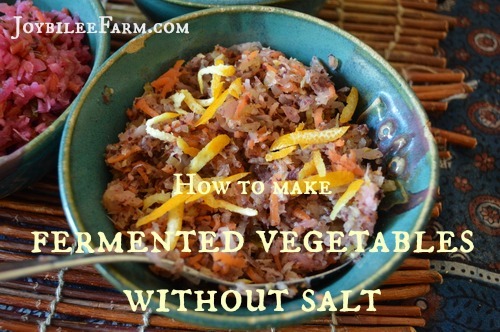 Here’s a few ways to lessen the amount of salt used in your fermented vegetables. Use at least two of these methods with each batch to guarantee success. Add 5 stalks of celery, finely chopped to each quart of other vegetables. Or juice 5 sticks of celery and add them to the finely chopped vegetables. Celery adds flavour without extra salt. Add ½ cup of dried dulse, kelp, bladderwack, or other seaweed, per quart of vegetables. This contributes natural sodium and other trace minerals to nourish the good lacto-bacteria, while inhibiting the undesirable bacteria. I buy my seaweed at Mountain Rose Herbs. Add ½ cup of whey from cheese making or from straining yoghurt to make lebna (yoghurt cheese). The whey is rich in beneficial lacto-bacteria and will inoculate your fermented vegetables, crowding out the bad bacteria. Take ½ cup of juice from a successful batch of fermented vegetables and use this to inoculate the new batch of fermented vegetables. You can add the contents of 3 probiotic supplement capsules to your batch of fermented vegetables to inoculate the vat. Use 3 capsules per 1 quart of prepared vegetables. When making homemade yoghurt you need to begin with a starter culture. This powdered culture can also be used to inoculate fermented vegetables. 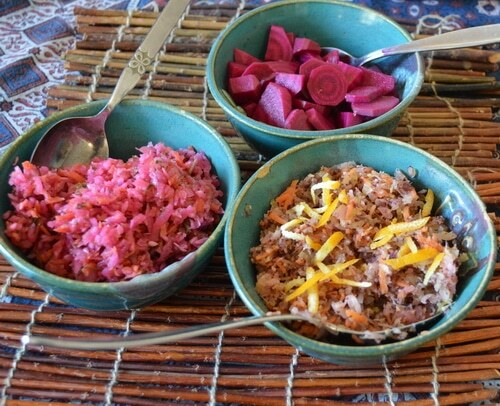 Use ½ tsp in ½ cup of water, per quart of fermented vegetables. Vegetables fermented without salt will have a sour, lemony taste – – more like a salad than a pickle. You can increase the lemony taste by adding a pinch of lemon zest before serving. They will be ready to eat in less than a week. Try taking a batch of low-salt fermented vegetables to your next potluck for a healthy, probiotic, salad. A dash of olive oil enhances the digestibility of the fat soluble vitamin A and beta-carotene in the fermented vegetables. Wow… I wish I knew about this sooner! What’s your opinion on applying this towards DIY kimchi? There is quite a bit of naturally occuring sodium in the celery. A tip: Vegetables that are naturally high in minerals often taste “salty”. Orach and spinach are two examples. fermenting but with my fist few batches I realized I do not like how salty everything tastes. So in researching I found your article. Thank you. I’m going to try the 1/2 cup from my previous attempts first. Hoping that gives me the just right sourness I was hoping for. Do you know if roasting my fermented veggies kills all the good probiotics. I liove roasted radishes but don’t want all of my fermenting benefits to be lost. Yes, you’ll lose the live bacteria if you roast it after fermenting. But you can get the best of both worlds by roast some of your ferment for flavor, and then adding in the live, raw ferment just before serving — 2:1 ratio. You’ll need to experiment to get the best flavor. Also if you dislike the saltiness you could try halfing the salt that the recipe calls. You might like it like that. I am really enjoying your content and information. Thank you for the great research and making our healthy food even healthier! This is very interesting, I thought salt was absolutely required when it came to fermenting veggies! Apparently not.. Thank you for sharing the multiple ways on how to do this! Curious to see how using the different ways of fermenting will change the taste of the end product. Nice work– we appreciate your review of the fermentation process, fermentation references, and your personal observations. This is a rich vein of information.